Publishizer’s fee is 30% of total preorders. That’s our entire pricing structure. First of all, we know you’ve spent a lot of time creating this beautiful piece of work and want to give it and yourself the best chances of being successful, without giving up too much of the pie. We also know that you know a successful book can be a transformative experience — you’ll not only become [more of] an influencer in the minds of your readers and followers, but you’ll act and think like one as well. Getting there is not easy. But we embrace that challenge and look forward to pushing the boundaries, together. We work with you to build and obtain as many preorders and funds as possible. The more preorders you obtain the more and bigger publishers will express interest in working with you. We’ve landed many traditional publishing deals, including deals with paid advances. A recent author of ours received interest from TenSpeed, Portfolio, Harvard Business Review Press and Macmillan — all big 5 publishing imprints. As you may know, they produce the highest quality books and give you retail distribution. They also are the most credible options in book publishing. If you can get 500+ preorders with us, we can negotiate offers from these types of publishers. We do not take a cut on the paid advance or royalties on book sales after the preorder campaign. This is what we’d like to do for your book. If this is what you’re interested in as well, let’s talk! What about Kickstarter and Indiegogo? First of all, Publishizer is not simply a crowdfunding platform like Kickstarter and Indiegogo. We are a digital literary agency and crowd-publishing platform with connections to traditional publishing houses and their imprints, such as Penguin, MacMillan, Hachette, Simon & Schuster and HarperCollins. As well as hundreds of hybrid, independent and service publishers. Here's a list to get started. Our goal with your book campaign is obtain 1,000+ preorders and get publisher interest who can offer you a deal (investment/advance) and get you retail distribution. Kickstarter and Indiegogo do not do this. They don’t cater to book authors. And they also don’t provide support, book marketing guidance, manuscript feedback or proposal writing. And they certainly don’t represent you to major publishers. Secondly, we’ve had authors try Indiegogo and Kickstarter instead of Publishizer and do no better than the average author on Publishizer, respectfully. On average, authors who’ve chosen another crowdfunding platform for their book campaign raised less funds and sold less copies. Your fee is higher on Publishizer but you get more in return. 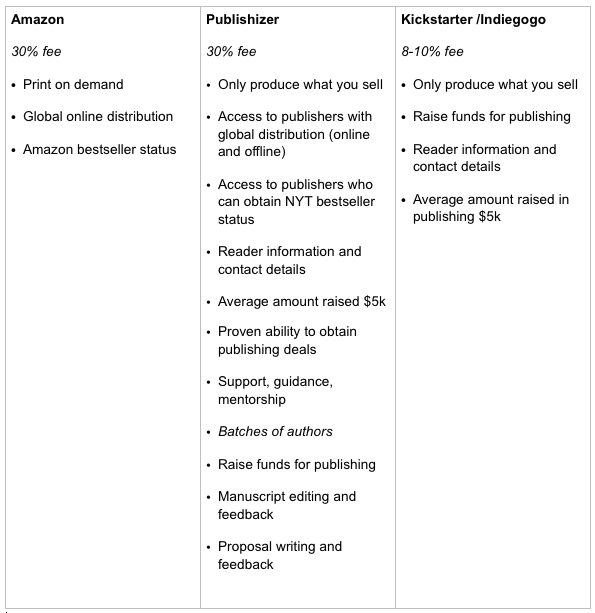 What about self-publishing on Amazon? If your goal is to make the maximum amount of money per book sale then this may be a good option for you. Maybe. Just know that the total number of books you will sell may be lower than you expect. What is a few extra dollars per book worth when you sell less than 200 copies? Rather, if your goal is to get your book in as many hands as possible then self-publishing may not be great. Amazon touts millions of readers but will not give you access to them. Editing, interior design, distribution, getting your book on retail shelves, and ensuring a quality book are not things Amazon does or cares about. Why should they? You’ll give them 30% without it. More information on ‘Batches of authors’ here. The bottom line is if you do not want support and guidance to raise funds and attract traditional book publishers, then Publishizer may not be a great fit. If you want easy access to millions (even hundreds) of readers, it doesn’t exist — on any platform. Whichever path you choose I wish you luck, and that you share your book with me regardless! If you’d like to crowdfund a book or connect with publishers, I hope you reach out.